New Orleans was founded in 1718 by the French as La Nouvelle-Orléans, under the direction of Jean-Baptiste Le Moyne de Bienville. The site was selected because it was a rare bit of natural high ground along the flood-prone banks of the lower Mississippi, and was adjacent to a Native American trading route and portage between the Mississippi and Lake Pontchartrain via Bayou St. John (known to the natives as Bayou Choupique). A community of French fur trappers and traders had existed along the bayou (in what is now the middle of New Orleans) for at least a decade before the official founding of the city. Nouvelle-Orléans became the capital of French Louisiana in 1722, replacing Biloxi in that role. In 1763, the colony was ceded to the Spanish Empire. Some of the early French settlers were never quite happy with Spanish rule, and repeatedly petitioned to be returned to French control. In 1795, Spain granted the United States "Right of Deposit" in New Orleans, allowing Americans to use the city's port facilities. Louisiana reverted to French control in 1801 after Napoleon's conquest of Spain, but in 1803, Napoleon sold Louisiana (which then included portions of more than a dozen present-day states) to the United States in the Louisiana Purchase. At this time the city of New Orleans had a population of about 10,000 people. From early days it was noted for its cosmopolitan polyglot population and mixture of cultures. The city grew rapidly, with influxes of Americans, French and Creole French, many of the latter fleeing from the revolution in Haiti. During the War of 1812 the British sent a force to try to conquer the city, but they were defeated by forces led by Andrew Jackson some miles down river from the city at Chalmette, Louisiana on January 8, 1815 (commonly known as the Battle of New Orleans). The population of the city doubled in the 1830s and by 1840, the city's population was around 102,000, fourth largest in the U.S, the largest city away from the Atlantic seaboard, as well as the largest in the South. New Orleans was the capital of the state of Louisiana until 1849, then again from 1865 to 1880. As a principal port it had a leading role in the slave trade, while at the same time having North America's largest community of free persons of color. Early in the American Civil War it was captured by the Union without a battle, and hence was spared the destruction suffered by many other cities of the American South. It retains a historical flavor with a wealth of 19th century structures far beyond the early colonial city boundaries of the French Quarter. The city hosted the 1884 World's Fair, called the World Cotton Centennial. An important attraction in the late 19th and early 20th centuries was the famous red light district called Storyville. Much of the city is located below sea level between the Mississippi River and Lake Pontchartrain, so the city is surrounded by levees. Until the early 20th century, construction was largely limited to the slightly higher ground along old natural river levees and bayous, since much of the rest of the land was swampy and subject to frequent flooding. This gave the 19th century city the shape of a crescent along a bend of the Mississippi, the origin of the nickname The Crescent City. In the 1910s engineer and inventor A. Baldwin Wood enacted his ambitious plan to drain the city, including large pumps of his own design which are still used. All rain water must be pumped up to the canals which drain into Lake Pontchartrain. Wood's pumps and drainage allowed the city to expand greatly in area. In the 1920s an effort to "modernize" the look of the city removed the old cast-iron balconies from Canal Street, the city's commercial hub. In the 1960s another "modernization" effort replaced the Canal Streetcar Line with buses. Both of these moves came to be regarded as mistakes long after the fact, and the streetcars returned to a portion of Canal Street at the end of the 1990s, and construction to restore the entire line was completed in April of 2004. The suburbs saw great growth in the 2nd half of the 20th century; the largest suburb today is Metairie, which borders New Orleans to the west. Metairie is not incorporated and is a part of Jefferson Parish. While long one of the USA's most visited cities, tourism boomed in the last quarter of the 20th century, becoming a major force in the local economy. 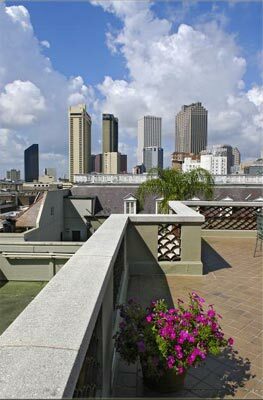 Areas of the French Quarter and Central Business District which were long oriented towards local residential and business uses switched to largely catering to the domestic and international tourist industry. A century after the Cotton Centennial Exhibition, New Orleans hosted another World's Fair, the 1984 Louisiana World Exposition.